Public Sunday running commenced on the 25th of March 2013. The track, train and operators were hired out on five occasions for birthday parties The following is a breakdown of the number of passengers carried in Rosehill Park in 2013. • March 2013 - 37 ( all on Sundays ) • April 2013 - 255 ( 174 Sundays, 81 Wednesdays ) • May 2013 - 185 ( all on Sundays ) • June 2013 - 332 ( all on Sundays ) • July 2013 - 299 ( 227 Sundays, 72 Wednesdays ), plus special event 219 passengers carried. • August 2013 - 453 ( 148 Sundays, 305 Wednesdays ) • September 2013 - 130 ( all on Sundays ) • October 2013 - 117 ( 100 Sundays, 17 Wednesdays ) Total for year 1738. Sunday 1333, Wednesday 405. plus special event 219 Birthday Parties 2013 Birthday Parties 2014 Five parties held in 2013. Eleven parties held in 2014. One held on the 27th April. One held on the 10th May. One held on the 28th May. One held on the 14 June. One held on the 1st June. One held on the 16 August. One held on the 23rd August. Two held on the 26 July. One held on the 31st August. One held on the 30 August. One held on the 20 September. One held on the 27 September. One held on the 05 October. One held on the 25 October. One held on the 08 November. .
Public Sunday running commenced on the 25th of March 2013. 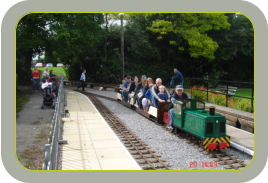 The track, train and operators were hired out on five occasions for birthday parties The following is a breakdown of the number of passengers carried in Rosehill Park in 2013. • March 2013 - 37 ( all on Sundays ) • April 2013 - 255 ( 174 Sundays, 81 Wednesdays ) • May 2013 - 185 ( all on Sundays ) • June 2013 - 332 ( all on Sundays ) • July 2013 - 299 ( 227 Sundays, 72 Wednesdays ), plus special event 219 passengers carried. • August 2013 - 453 ( 148 Sundays, 305 Wednesdays ) • September 2013 - 130 ( all on Sundays ) • October 2013 - 117 ( 100 Sundays, 17 Wednesdays ) Total for year 1738. Sunday 1333, Wednesday 405. plus special event 219 Birthday Parties 2013 Birthday Parties 2014 Five parties held in 2013. Eleven parties held in 2014. One on the 27th April. One on the 10th May. One on the 28th May. One on the 14 June. One on the 1st June. One on the 16 August. One on the 23rd August. Two on the 26 July. One on the 31st August. One on the 30 August. One on the 20 September. One on the 27 September. One on the 05 October. One on the 25 October. One on the 08 November. .